NextEra Energy began construction last year on the 2.8 square mile Genesis Solar power project in California's Chuckwalla Valley. The desert habitat was home to kit foxes, a mostly nocturnal animal that feeds on insects and small reptiles. 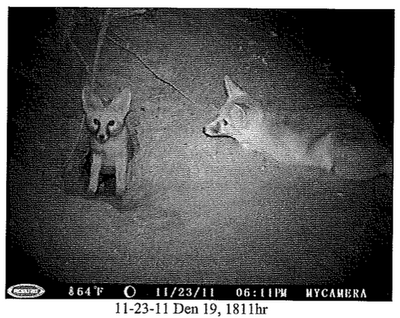 According to the California Energy Commission (CEC), 65 active and inactive kit fox burrow complexes were found on the project site. 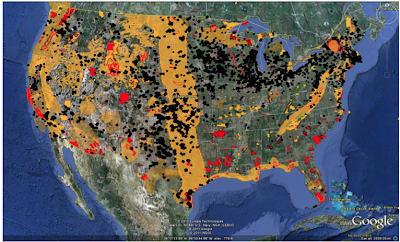 Conservation groups and concerned citizens submitted comments last week on the Department of Interior's proposed policy to guide the siting of utility-scale solar on public lands. Although the policy represents an improvement from an earlier draft, the common denominator among the comments was that the proposed policy is still too weak to prevent industrial solar development from inflicting irreparable harm on our desert ecosystems. In the meantime, we continue to face a status quo where the solar industry has unfettered access to bulldoze some of the most treasured public lands in America's southwestern states, ignoring a more efficient alternative of installing solar panels in our cities. In the video above, a contractor for BrightSource Solar destroys desert vegetation, including a cluster of Yucca that are probably 400-800 years old. The President spoke of our public lands only in the context of industrial energy exploitation in his State of the Union speech. I truly hope he realizes that these lands are cherished for their beauty, solitude, and peace. "From sea to shining sea" was not inspired by the sight of transmission lines, natural gas fracking, oil rigs, and massive bird and bat-killing wind turbines. "God's cathedrals" -- our natural wonders -- cannot be taken for granted. And clean energy is not about jobs, it is about our health, and living in harmony with nature without destroying it. We can meet our energy demands with increased energy efficiency and clean energy at the point of use -- such as rooftop solar. We cannot afford to sacrifice more wildlands to energy exploitation when we are being handed this opportunity to change. 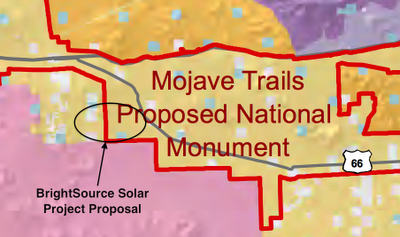 BrightSource Energy is considering another solar thermal facility in the Mojave Desert that, if approved, would fall within or immediately adjacent to the boundaries of the proposed Mojave Trails National Monument. The Monument was introduced in the California Desert Protection Act of 2011, and endorsed by the Obama Administration as lands deserving protection. The project would be built on ecologically important desert habitat within view of the iconic Amboy Crater and Historic Route 66, and impact lands conserved and donated to the Department of Interior by the Wildlands Conservancy. According to an interview with the Press-Enterprise, BrightSource Energy has already entered into talks with a utility company that would buy the electricity if the project is built. The Bureau of Land Management, however, has not begun the environmental review process for the solar project, and as of late 2011 was under the impression that the project would be withdrawn. BrightSource Energy is on the defensive as wildlife officials express valid concerns that its proposal to bulldoze 9 square miles of California desert will kill protected raptors and migratory birds, in addition to concerns about other wildlife and rare plants. 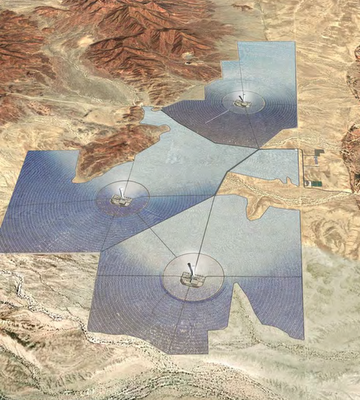 BrightSource proposes to build two new projects that involve thousands of large mirrors called "heliostats" that focus the sun's rays at a central point on top of a 750 foot tall "power tower" to heat a steam generator. The super-heated air around the top of the tower is likely to "incinerate" eagles and other birds that fly above the facility, according to communication between the California Energy Commission (CEC) and the US Fish and Wildlife Service (FWS). The other major threat will be the thousands of heliostat mirrors that reflect the sky and cause bird collisions. A grassroots effort is under way in Las Vegas to stop urban development from encroaching on one of the city's most popular outdoor respites -- Red Rock Canyon National Conservation Area. The beautiful yucca and blackbrush scrub habitat gives way to unique geologic features that attract hikers, bicyclists, rock climbers, photographers, and anybody else that wants a breath of fresh air and a break from the city. But now a housing developer wants to build up to 4,500 homes just south of the open space, which would probably affect wildlife linkages and also greatly increase vehicle traffic on otherwise quiet roads. The group Save Red Rock Canyon has organized rallies to bring attention to some of the developments threatening the surrounding desert habitat and recreational space. The effort has even encouraged a normally apolitical rock band to speak up. Locals (and rockers) concerned with the threat to Red Rock plan to attend an 18 January Clark County Commission meeting. How Many Plants Species in the Desert? Would you expect that California's desert hosts gives the redwood forest a run for its money when it comes to plant biodiversity? It's easy to take the desert for granted when all you want to do is zoom through it on the highway and get to your destination. But you are passing by an amazing and biologically diverse ecosystem. There are at least 2,450 native plant species found in California's desert, according to a great article by Chris Clarke on desert life, posted at KCET. If you want to learn more about our amazing deserts, join Desert Biodiversity, a new organization dedicated to exploring, respecting and defending the deserts.